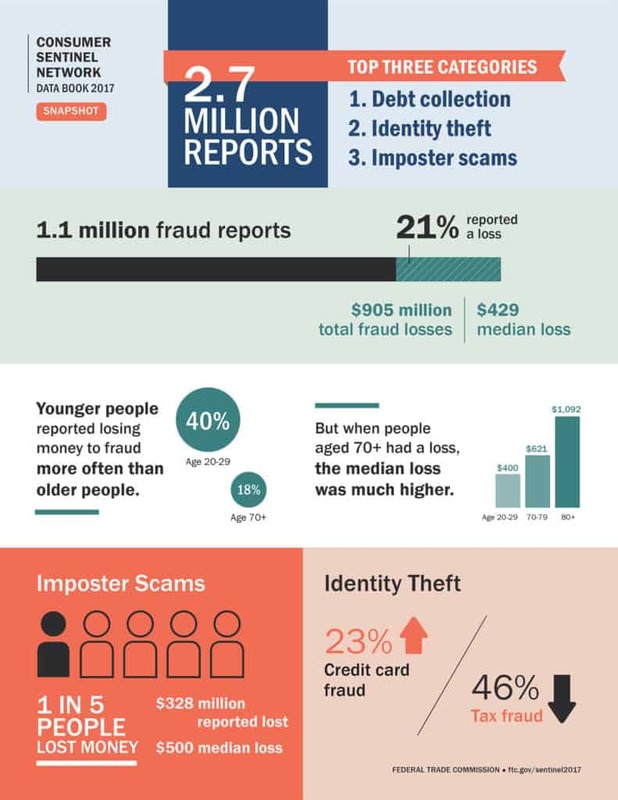 *This list is regularly updated with the latest identity theft statistics for 2017 – 2019. To date, we have compiled over 50 identity theft facts, figures and trends from a wide range of sources and covering a number of different countries. As the world continues its relentless march toward all things digital, data is increasingly exposed. Each individual consumer’s’ personal information now resides on dozens, if not hundreds of servers across the globe. With that fact comes a somewhat obvious result: an increase in identity theft. Data theft is a big business. According to Javelin Strategy, the number of identity theft victims in the US rose to 16.7 million in 2017. The cost of all of that lost data amounts to over nearly $17 billion. 2017 was not the worst year for identity theft losses so far, however. By comparison, 2012 was the highest at a loss value of $21.8 billion. Additionally, Javelin Strategy found that children are increasingly the victims of identity fraud. While children have long been a target for Social Security Number misuse and credit card fraud, it appears the impact is growing. The security firm found that over 1 million children were ID theft victims in 2017. For 2017 and 2018, identity theft statistics have taken center stage among the many stats and facts encompassing the entire realm of cybercrime. While ransomware gains more attention, identity theft remains much easier to pull off and monetize. Social security numbers, credit card numbers and other personal identity factors can be stolen and sold on the dark web, or used by criminals for quick and easy profit gain. The following identity theft statistics are categorized to help get a better feel for how and why this threat continues to be a problem for consumers, businesses, and governments worldwide. As data from the 2018 Identity Fraud Study by Javelin Strategy and Research has shown, identity theft isn’t going away. Cybercriminals are still finding a relative ease-of-access to consumer data. Javelin Strategy, in particular, discovered that fraudsters notched over 2 million more victims to their belts in 2017. The numbers reveal that contrary to efforts to stem the tide of data theft, thieves are learning new ways to bypass protections, while consumers are facing even more risks and exposures to data theft. Credit card fraud is nothing new. Yet the introduction of the credit card a half-century ago quickly became an opportunity for thieves. Still, it wasn’t until the introduction of e-commerce in the mid-1990s that stealing credit card information became far too easy. Now, rates of what is known as “card-present” fraud (where a fraudster is using a physical copy of the skimmed card) are going down, thanks in no small part to the introduction of the EMV chip. However, CNP or “card-not-present” fraud events may soon rise dramatically. Alongside the ongoing threat of Social Security Number theft, it’s easy to see why identity theft as a whole is not going anywhere. The following statistics and facts reveal why both credit card and Social Security Number theft are still problems. According to FICO, the EMV switchover in the U.S. is likely to lead to a 300% increase in credit card application fraud as criminals attempt to bypass the chip system. (Source: FICO). Identity theft is increasingly a 21st-century problem. As more data moves off of physical paper and onto Internet-connected servers, the chances of that data getting stolen increases as well. While “malicious outsiders” remain active in stealing data (and by extension, loss of credit card numbers and Social Security Numbers), consumers share a good part of the blame for their lost data. Nevertheless, there are some positives that have emerged in response. Thankfully, Consumers are getting slightly better at detecting fraud attempts. Javelin Strategy and Research found that online shoppers tended to be quick at identifying fraud attempts. Surprisingly, 78 percent of fraud victims were able to detect fraud within a week’s time. Still, identity theft prevention appears to be on the rise despite savvier consumers. Data breaches show no signs of decreasing. And unfortunately, consumers still appear to be less than proactive when it comes to securing their private information.